Don’t forget to pick up Loch for .99! Zane (The Powers That Be, Book 6) .99 through Feb. 18! Zane (The Powers That Be, Book 6) is LIVE! A Powers Play (The Powers That Be, Book 1.5) is LIVE! Get The BFD today for only .99! Giveaway! Enter for a chance to win The BFD! Click on the image to enter! Only .99! The BFD is LIVE on Amazon, BN, iBooks, Kobo & Google Play! Live on Amazon, BN, iBooks, Kobo & Google Play! 😀 Only .99 for a limited time! OMG I’m so thrilled to introduce my guest author for September! I met Kristi three years ago when I got my hands on her book Pure Will & LOVED IT! I laughed, cried and fell in love with Will (Yowza!) and Camden, who’s so freaking adorable. Such a cute couple and the book was perfect with all kinds of twists and turns that surprised me to the very end! Now, although Kristi’s a Kansas Jayhawk fan & I’m an OU Sooner fan, we still get along because she’s a CUBS FAN TOO! WOOHOO! Plus, she’s just kinda awesome on top of that 😁 She’s got a great sense of humor which plays a big part in most of her books, and I find myself cracking up when I’m reading them. Dibs had me howling several times especially at Sam’s dates 😂 Kristi writes contemporary and new adult romance, and I promise, there’s something for everyone in all of her books! Let’s find out more about Kristi! 4. What’s something that a ton of people are obsessed with but you don’t get the point of? 5. What are you looking forward to most in the next 10 years? 6. What fad or trend do you wish would come back? 7. Would you rather give up bathing for a month or give up the internet for a month? 8. What’s your guilty pleasure on Netflix? 10. What do you munch on when writing? Kristi: Indeed…is there someone who hasn’t?? 12. Music or silence when you write? 13. Is there any other genre you’d like to try writing? 14. How do you choose the names of your characters? 15. What does literary success look like to you? 16. Anything you’d like to say to your readers and fans? Kristi: Thank you, thank you, thank you…from the bottom of my heart. There are so many books/authors…that you chose me… my cup runneth over!! 17. Can you tell us what you’ve got coming up next? 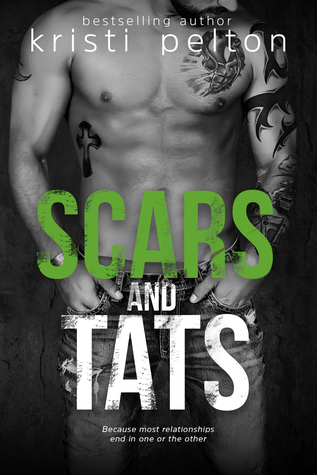 You can purchase Kristi’s latest book Scars and Tats on Amazon KU by clicking the gorgeous cover below! Find Kristi’s books on Amazon! Find Kristi’s books on BN! Kristi’s giving away TWO ebooks and ONE signed paperback to three lucky winners, winners’ choice of which book! To enter, either “Like” her Facebook page, follow her on Twitter or Instagram or “Friend” her on Goodreads (or do all!) then comment on this page that you did! Good luck! Teaser Pic! The BFD (A Big Deal Romantic Comedy) Coming Sept. 30! COVER REVEAL! The BFD Coming Sept. 30! Jada D’Lee Designs does it again! I LOVE it!! The BFD Cover Reveal August 30! The BFD (A Big Deal Romantic Comedy) Coming Sept. 30!